Your True Nature and Project L earning Tree are delighted to announce that we are teaming up to help further our organizations’ collective impact on environmental education! Our missions share fundamental values and principles, including growing a love of nature and fostering meaningful outdoor learning experiences. You have probably seen Your True Nature’s popular Advice from Nature bookmarks, magnets, books, and posters at your local gift store or one of many national parks across the country, or you may be one of their 500+ teacher members who use their materials in your classroom. Your True Nature (YTN) has created over 200 Advice messages, providing inspiration to people across the globe! The Advice from Nature concept celebrates the wisdom of nature and invites everyone to connect with and learn from the living world around them. 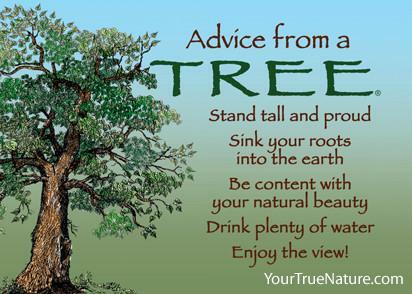 Go to yourtruenature.com/plt to explore YTN’s Advice from Nature products as well as a variety of free resources, including lessons for specific topics and grade levels, correlations to PLT activities, and printable handouts for PLT workshop facilitators. To celebrate our partnership, YTN is offering a 30% discount on all Advice items through the end of August for members of the PLT community. Plus, an additional 10% of all purchases will be donated to PLT. Enter the code EDUCATOR-PLTDIS at checkout to receive your 30% discount. To repay the earth for its generosity, all YTN products use recycled paper and are 100% replanted with nearly 120,000 trees that have already taken root! Your PLT orders can make a difference in many ways. YTN will plant additional trees for each PLT order over $30 and report back each year how many trees will be planted from PLT orders! Through our partnership, YTN and PLT will promote environmental education, increasing awareness and conservation of the beautiful world that is in our care. 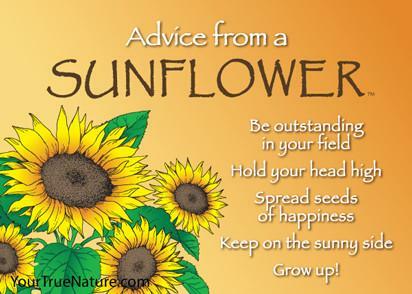 We hope you’ll find something special to share the love of nature with your community and take some Advice from a Sunflower: Spread Seeds of Happiness!